Unverified releases of all formats, and DVD-Screeners, cams, TS, etc. Plot: - In 1982, an alien ship stops directly above Johannesburg, South Africa. Reports suggest the ship became stranded after a command module separated from the ship and dropped to Earth, nowhere to be found. After cutting their way inside, a team discovers a large group of malnourished and leaderless arthropod-like aliens. 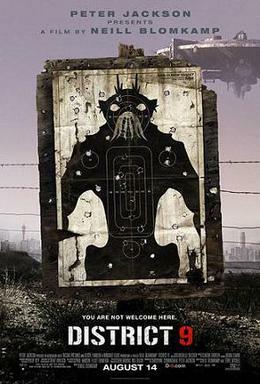 The creatures are taken from the ship and housed in a government camp inside Johannesburg called District 9, which eventually turns into a slum. In the first decade of the 21st century, Multinational United (MNU), a private military contractor, is placed in charge of policing and relocating the 1.8 million aliens to District 10, a new camp 240 kilometers northwest of Johannesburg. Wikus van de Merwe (Sharlto Copley) is an MNU field operative assigned to manage the relocation operation, which begins with the serving of eviction notices on August 9, 2010. As the eviction unfolds, three nearby aliens -two adults and a child- distill a liquid from a piece of alien technology into a small canister. During the raid, Wikus finds the device and accidentally sprays some of the liquid on his face. Wikus confiscates the device and attempts to evict its owner, an alien named Christopher Johnson by the MNU, but he questions the legality of the eviction and demands his rights. That night, Wikus, having already recieved an arm injury during the evictions, falls ill and is taken to a local hospital, where they find his wounded left arm has become an alien appendage. He is then taken into custody by MNU personnel who intend to vivisect him in an attempt to replicate his ability to operate alien weapons, initially only operable by aliens, but Wikus' new strength allows him to overpower his captors and escape. Now a fugitive, Wikus takes refuge in District 9 and returns to Christopher Johnson's hut. Christopher reveals that the canister Wikus confiscated contains fuel for the lost command module hidden under his hut, which would allow him to activate the mothership and leave the planet. Christopher agrees to help reverse Wikus' genetic transformation if he, in turn, retrieves the fuel canister. Wikus agrees and goes on to steal some alien weaponry from a local Nigerian gang led by paralyzed warlord Obesandjo, who wants to eat Wikus' mutated arm, believing it will give him the power to operate the weapons himself. Wikus and Christopher break into the MNU offices and retrieve the canister. They then fight their way back to District 9, but Christopher, having just learned that MNU is performing medical experiments on his race, informs Wikus that he has decided to return to his homeworld to seek help for his people before he can cure Wikus, which would take three years. Frustrated, Wikus knocks Christopher unconscious and powers up the command module with the help of Christopher's son. MNU soldiers shoot down the spacecraft before it could fly to the mothership. MNU forces take Wikus and Christopher prisoner but Obesandjo's gang ambushes them on the way out. The Nigerian gang captures Wikus and prepares to sever his mutated arm for Obesandjo. From the command module, Christopher's son activates the mothership and a mechanized battlesuit that kills Obesandjo and his men. Wikus then gets into the suit and rescues Christopher from the MNU mercenaries so he could get to the command module. Promising Wikus that he will return in three years to reverse his transformation, Christopher summons a tractor beam and docks with the mothership. Heavily wounded and in a much more advanced state of his mutation, Wikus crawls out of the robot when Venter, the sole survivor of the MNU squad, confronts him. However, aliens in the camp dismember and eat Venter before he is able to kill Wikus. Johannesburg residents suddenly celebrate the mothership's departure, with a series of interviews and news broadcasts providing various opinions on the events. The aliens are successfully moved to District 10, said to have a population of 2.5 million and growing. MNU's illegal experiments on aliens are revealed; some people theorize about Wikus' fate, others hypothesize that the aliens might return for the refugees, or even to declare war on humanity. Wikus' wife reveals that having found a small metal flower on her doorstep, she has hope that her husband is still alive. Later, in a scrapyard, an alien, wearing bandages on his arm, is seen crafting a similar flower out of metal. If anyone has any screen shots feel free to post them. This is sub dvd quality with a few audio cuts/splutters associated with R5. Sorry, I forgot this website had a "Screeners & Unverifed Releases" thanks for the move. Woe be unto him who opens one of the seven gateways to hell, because through that gateway evil will invade the world.